Hi, I’m Corey, welcome back to the Cal-Mil classroom. Today I want to walk you through the benefits of adding risers to your foodservice presentation, as well as some of the different materials and styles we have to offer. When making a food presentation, the key is to add dimension by creating different levels to showcase your culinary presentations. You can even turn some of our risers upside down and fill them with whole fruit or decoration. As you can see, with some of the risers in front of you, some of the materials we offer are bamboo, wood, plastic, metal, and more. With styles ranging across the board, covering every occasion, from basic risers for relaxed environments, to high end styles for hotels and restaurants, we’ve got you covered. To see our entire selection of risers, visit us online at Cal-Mil.com, or, simply order a catalog at that same website. That’s all I’ve got for you today, be sure to give your food the presentation it deserves. We’ll see you next time at the Cal-Mil classroom. 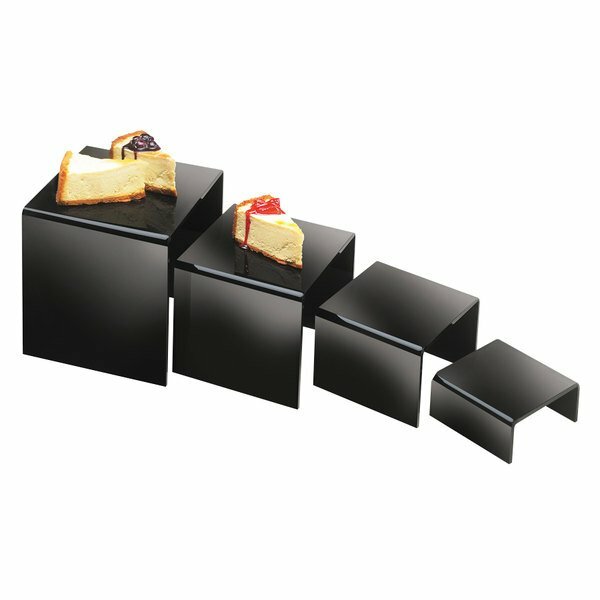 Showcase your culinary creations with Cal-Mil’s wide variety of risers! With styles and materials ranging from metal, bamboo, wood, plastic, and more, these risers are sure to give your food the display it deserves! Follow the steps to incredible display opportunities with this Cal-Mil 237 black acrylic riser set. 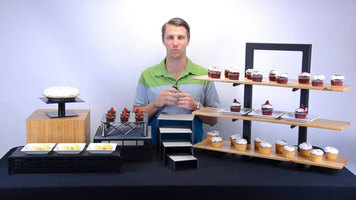 The four risers are designed in incrementally larger sizes, allowing you to create multi-tiered platforms for showcasing featured appetizers, dessert delicacies, or even drink specials at your hotel, banquet hall, or club. The Cal-Mil 237 set of four risers is made of lightweight acrylic, and each riser can nest within its larger counterpart for efficient space storage! These risers are food-safe so you can place your offerings directly onto the risers or use plates depending on whatever best suits your display needs.